The three Pushkin judges this year were poet and playwright Stewart Conn, Rosemary Goring, who is the Literary Editor of The Herald and the novelist Nicola Morgan. Charlotte shared joint First Prize with Gwen Hart of Shawlands Academy. Their winning portfolios were chosen from over 200 entries from 50 schools across Scotland. The ten prize winners are spending this week together on a course at the Moniack Mhor Writers' Centre with writing tutors Catherine MacPhail and Gerry Cambridge. 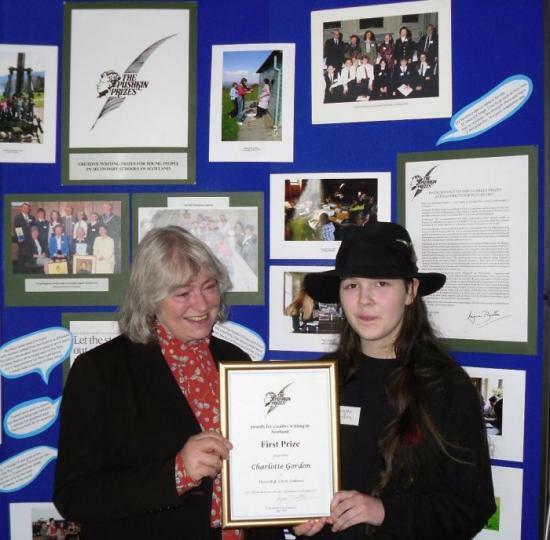 Charlotte is pictured with her English teacher, Mrs Doake, who also attended the Award Ceremony in Edinburgh.